I knew it! I had a hunch that the RBNZ would cut interest rates and sound extra dovish in their policy statement… and they did! 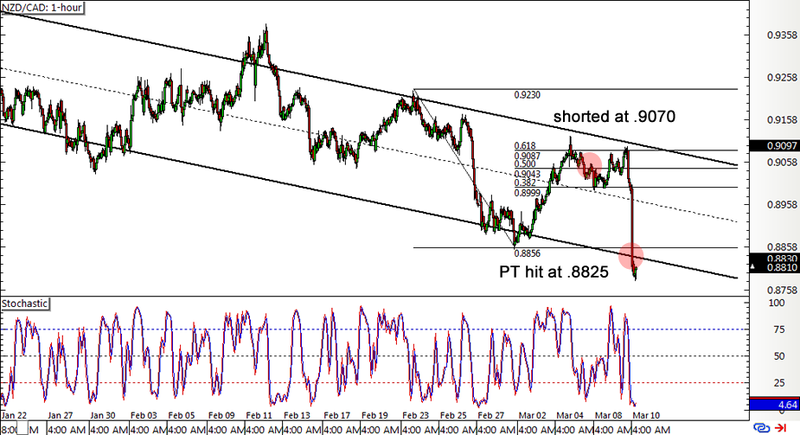 Here’s how my NZD/CAD short forex trade fared. In case you’re just tuning in, better take a look at my initial trade idea and my earlier NZD/CAD update first. I was feeling extra nervous ahead of the BOC interest rate statement and ready to close my position in case Governor Poloz says anything dovish, but they decided to keep rates unchanged and give a somewhat optimistic statement. Still, NZD/CAD popped back up to the channel resistance and 61.8% Fib ahead of the RBNZ statement so I was pretty much holding my breath before Governor Graeme Wheeler grabbed the mic. You can imagine my relief when he announced a 0.25% rate cut! NZD/CAD plummeted all the way down to my profit target at the bottom of the descending channel, giving me a 245-pip win or a 0.6% gain on my forex account for a 1.2-to-1 return-on-risk. Boo yeah! I think this pair has more room to go since the strong bearish vibes for the Kiwi are allowing it to break below the channel support, but for now I’m be content with my winnings on this short-term play. Got any short NZD setups you’d like to share?